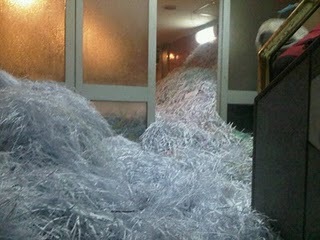 Photo of shredded documents at state security headquarters in Nasr City, Cairo. Photo by Tarek Al-Araby. Egyptian protesters today invaded state security offices in several locations Mar. 5 and 6, freeing prisoners, seizing records and capturing state security officers, often in the act of shredding or burning incriminating files. They invaded state security buildings in Alexandria, Aswan, and other locations. The most significant building invaded by citizens was the State Security building in Nasr City. For Egyptians, the Ministry of the Interior is a frightening entity, and the headquarters in Nasr City is a building into which people go in bound and blindfolded, and from which many never return. Horrific tales were told of it by taxi drivers, none of whom actually knew anything about it. The official name is Mabahith Amn ad-Dawla al-‘Ulya (State Security Investigations Service), or Amn ad-Dawla for short. It is also often called the SS and “Stasi” after the WWII gestapo it in some ways resembled. Emboldened by the fall of the Shafiq government and the ousting of Habib al-Adly, for 15 years Minister of the Interior, a group of Egyptians surrounded the building around 4pm and, after some negotiation, were allowed to enter by the military officers charged with its security (perhaps because, as an AP story claims, it could not stop them). Building is a misnomer; “complex” is a better term for a span of buildings and underground tunnels, basements and subbasements. Inside were found luxurious suites, exercise rooms and high-tech offices, as well as torture chambers, some filled with blindfolded prisoners, one of whom claimed to have been held there for 14 years. Inside they found torrents of shredded documents. Leaders received messages from Wikileaks promising the assistance of its world-class document restoration team to piece the documents back together. A large number of intact documents were also found, including a few indicating that the ridiculous claim that the US, Iran, Israel and Hamas were jointly behind the protests as a way to destabilize Egypt may have reflected actual intelligence “findings”. “No wonder they were only good at torture not intelligence” quipped the administrator of the “We Are All Khaled Said” Facebook page. Some documents are dynamite. Perhaps the most startling are files that apparently describe the planning and execution of the Alexandria New Year’s church bombing by state security itself. Other important finds are said to include names of the Ministry’s spies within opposition parties (apparently including some well-known public figures), spies within the Muslim Brotherhood and lists of political prisoners and the torture devices used on them. Also among the intact documents were thousands of files kept on various individuals–Islamists, atheists, communists, bloggers, activists, union members, members of the regime itself, and even people who called in to talk shows. One document describes a plan to “make a fake announcement in the media that State Security is disbanded” while reconstituting it under another name, with some cosmetic changes to appease the public. Documents are being scanned or photographed and posted to sites like flickr before being turned over to the public prosecutor. Making public the documents seized from the security agency is, of course, a mixed blessing. Most of the documents that could have been used to prosecute State Security officers have been shredded or burned; many of the available documents reveal damaging personal information about people who may not be guilty of anything except coming under scrutiny. It is not clear how much discretion people are showing. The invasion of the buildings began in Alexandria, where security officers opened fire on the protesters from inside. More than 1,000 people stormed the building, forcing their way inside. AP reported four protesters were wounded and more than 20 security officers were badly beaten. Among the bizarre finds were closets of women’s clothing which prisoners were forced to wear as part of their torture. For a rich account of events and what’s been found, with lots of pictures and videos, visit Zenobia’s The Egyptian Chronicles blog. You can also follow @SSLeaks on twitter for ongoing posts as to what people are finding. ← Did Cairo Influence Wisconsin Protests?